I agree with you BE. I think in part Andy sees AF say something and automatically has to take a different position. If the Phils - as they are lead today, not 3+ years ago -had something they wanted to spend on today, they’d find a way. See above - mlb.com reporting more signing bonuses.The Ortega bonus (not yet reported) was rumored to be about $500k or a bit more; if this is accurate, the Phils are basically tapped out, pending trades for more pool dollars. If Ortega is the $575K projected in Fangraphs they would be at $4 million so far so likely they have traded for at least $500K in allocations. Looks to be a pitching-heavy class. Not much offense compared to previous classes as they are taking mostly defensive-first types at SS and C.
Great work. The Class already has more people in it than I thought it would. It's always interesting that your argument always comes down to if someone disagree with your stretches it has to be blind allegiance or wishful thinking. 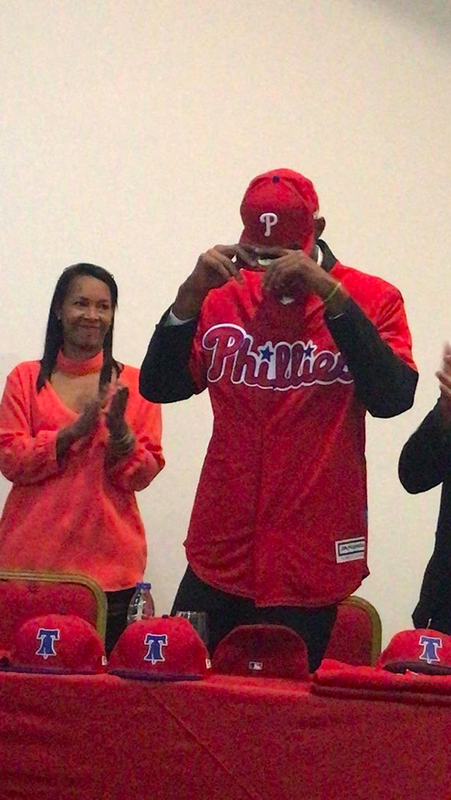 The Phillies have a different philosophy for international signings. You don't agree with it but if you look through our list of top prospects it seems they may know what they're talking about. You have come to the conclusion your desire for what they should be doing is better than what they are doing. You then build on that with false narratives and when that fails, you move the goalposts to make it seem like they aren't doing enough. They traded for more allocation last year but you assume that the issue is money and not philosophy. You have pushed this narrative for years and when facts fly in front of your idea, you change the conversation. We all get it...you want to spend more than anyone and like how the Yankees and others do it. that isn't what the Phillies are going to do and it has ZERO to do with money or their ability to get it. I didn't really have high expectations for this class either. Thanks, but mostly not my work. 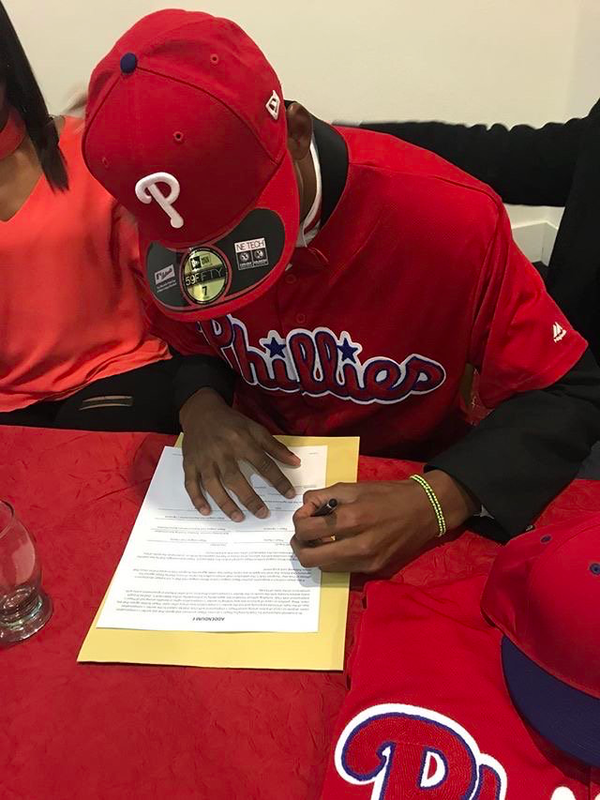 MLB and BA both have "trackers" (not really tracking databases, but articles with lists of some of these guys, and writeups on the "top" prospects), and Jim Peyton obtains, and posts, lists of transactions directly from the Phillies at the Complex. Don't know the quality of all these guys (others will know more), but they're mostly 16 years old. 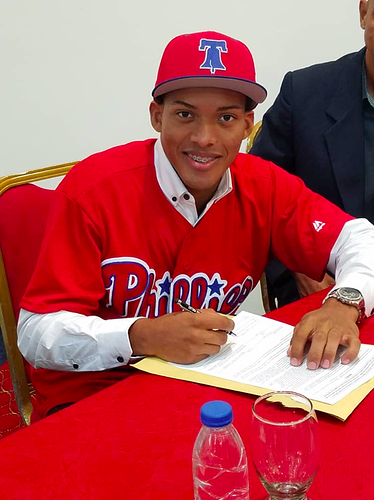 I'm sure as the year goes on, we'll see the usual signings of more older guys to fill out the Dominican complex and keep the DSL/GCL rosters full. Has anyone ever seen a comparison of international players and were all the ones that make it to the majors and have some type of career signed at 16? I honestly wonder if there are not some that are older when they sign. My guess is that most of the all stars were signed at 16 from DR and Venezuela (and others), but I wonder how often a guy develops later and still has a solid career. I only ask because of course we dont do that with US players (including Puerto Rico). They develop in school and possibly in college, and some get much, much better in that time. There are many US based players that might not have even been seen as prospects when they were 16 but by the time they are 22 they have developed into future stars. You apparently are not reading what I am saying. I agree with lots of their philosophy. But yes, they should max out the money they spend. That they do not do this is not because they are cheap. It is because they are losing prospects to other teams. It is their execution that is B+ not their strategy. You seem to be arguing that money is not important and whatever the Phillies do is perfect? If that is not your argument then perhaps say what you actually think. I have made a pretty coherent case that the Phillies have not done all they could do. We actually don't have that great a record of signing international talent. It is clearly better now than 10 years ago. But why are they not doing all they can do? Well, other teams are competing with us, and they probably have their own network of contacts. Most of these players are such long-shots that it would be stupid to get into a bidding war, so it usually comes down to whether your local guys have a better web of contacts. I'm just happy they're giving Sal the resources to compete on an even playing field. I don't expect him to get every player they target, as long as they consistently put together solid classes of LA players, I'm happy. Without trading for allocation, Sal is not competing on an equal level. First, MLB assigns allocation at 3 levels, depending on how 'big market; the team is. We are in the lowest level of those three groupings. Secondly, we lost allocation for signing two comped FAs this past off-season. Unless he went into his scouting/commitment season being told by upper management that he should plan based on knowing that the Phillies would trade for allocation, then Sal was working from the smallest budget in baseball. Since the bonus commitments are made well prior to 2 July, and because Sal needs to preserve his credibility to be effective, he can't recruit top prospects beyond the budget he knows he has -- the team needs to tell him for 100% certain that they will be trading for at least $X of allocation for him to bring in the maximum talent haul. But don't you think AF is correct that most scouting, and even most informal commitments, is done further ahead of time? I would think Minnitti and Sal had a pretty good picture of what they wanted to spend and who was signable before Klentak decided to make those free agent signings, and if those signings did directly affect things, they would have told him that he needed to go get them more allocation. They may indeed have failed to beat out certain teams for players but it wasn't because they didn't make the trades or couldn't write the checks (just like they also got beat out for Ohtani, or even Darvish). It seems to me allocations are worth more early than they are late too. Like the Red Sox just traded a pretty good minor leaguer (their #9) prospect for $1.5 million. That's a choice you make. Without trading for allocation, Sal is not competing on an equal level. The Phils are, IMHO, obviously going to trade for allocation. Just the current list of people signed yesterday is probably untenable without doing so - and that's without the anticipated bonus for Ortega. Or they already have and it hasn't been announced, or they have agreements lined up but they haven't been filed. Yeah. It's possible that the reason the Ortega signing hasn't been announced, or confirmed anywhere (neither MLB nor BA) is that the Phils are delaying it pending completion of some transaction involving bonus allocation. Hey! The Orioles are pretty notorious for trading away their allocation. Perhaps the Phils are working on a bundled deal involving bonus allocation and... a player? The Phils announced the signing of 14 international free agents - the 14 we have already listed above, and not including Fernando Ortega.